A Thumbies personalized print charm is such a unique and precious piece of keepsake jewelry, created from actual fingerprints, handprints, or footprints. Combining the wonders of modern scanning technology with the ancient technique of lost wax casting, the prints are fashioned into artistic and intricately detailed memorial jewelry. 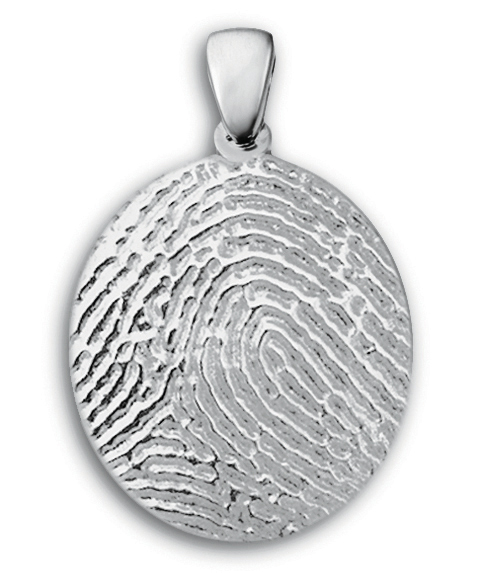 We offer our fingerprint jewelry in many different articles such as necklaces, pendants, lockets, and even wedding rings. Each piece is fully customized and the designs are always unique to each individual. We even provide engraving as requested. Our jewelry is created with high quality gold and silver. We've spoken to many of our customers who have purchased for family members of the deceased to comfort them. A very popular option also is to celebrate a baby birth by purchasing a thumbprint keepsake. There are so many ways to keep your loved ones close to you always. A Thumbies personalized print charm is such a unique and precious piece of jewelry, created from actual fingerprints, handprints, or footprints. Combining the wonders of modern scanning technology with the ancient technique of lost wax casting, the prints are fashioned into artistic and intricately detailed jewelry. A "Buddie" is a pet related pendant with a paw or nose print. These charms are truly the ultimate keepsake gift idea for a loved one – or for yourself! They are a touching way to remember a parent, spouse, sibling, child, friend or pet and to keep their memories alive and close to you in your everyday life. The personalized print charms are available in sterling silver and 14K yellow and white gold. The "standard-sized" charms are about the size of a dime and the "grand-sized" charms are about the size of a quarter. Each charm is listed individually on their own web pages. You may select a small synthetic birthstone or a genuine diamond if desired to be included at the top of the charm (on the “bail” or hoop where it connects to a chain), adding elegance to each finished piece. You may purchase your charm with an 18-inch gold or silver chain with a high-quality closure. You will have a chance to provide engraving when you order on-line or when you receive your ink print kit and send your prints in to our jewelry designers. The engraving is done on the back side of the charm in capital letters using an Arial font. A script font may also be requested. You should have your print before you order your piece. 1) We can mail a Print Kit (Ink strip, card and Taking a Great Print instructions) to you if you need one to take the prints (the kit comes with a self-addressed envelope so you'll know where to mail the prints). Or if you already have an ink print taken, you may submit the print when you place your order at TearCatcher.com- Please be sure to scan each print individually at 600 dpi, crop out extra white space around it, and save it as a jpeg file. 2) Select your preferred piece of jewelry and place your order. 3) We will confirm that we received your order and your print. From the time your print is received, it takes 4-6 weeks for production. Each keepsake charm is one-of-a-kind and is truly as individual as the print it replicates! These charms make uniquely personal wedding, anniversary, birthday, Mother's Day, and remembrance gifts. Take me to your products! This was the best experience I ever had shopping online. I would recommend this site to anyone and intend to buy here again SOON. Thanks, yours was one of the few items ordered on-line that made it in time for Christmas. Amazing customer service! They exceeded my expectations and because of their quick response, I was able to have a gift in time for my friend visiting from out of state. Thanks again, Tearcatcher Gifts. This is the second time I have ordered from Tear Catcher, and it won't be the last. They are extremely responsive, thoughtful and do whatever is necessary to make your buying experience a good one. Joe sent me an e-mail letting me know he had changed the shipping to one that was going to cost about the same but would get my merchandise to me in a more timely manner. Not many places would do that. I appreciate the time taken to read my e-mails, especially when I start rambling about the reason for my purchase. Again, I don't know of ANY merchant that would do it. Thank you once again for your interest! We hope to hear from you if you have any questions.